Pat Scanlon and other members of Veterans for Peace were interviewed for this excellent article in the Boston Globe. So proud of our veterans who have seen the horrors of war, and now commit themselves to peace. It is very well written, and addresses current issues such as Islamophobia. In a voice that issues with a rat-a-tat-tat, Pat Scanlon, Vietnam veteran, war protester, songwriter, recycling guru, and registered nurse, makes his pitch for peace. Scanlon, a leader of the Smedley D. Butler Brigade chapter of Veterans For Peace, named for a decorated World War I Marine general who became an outspoken critic of war, is here to show a film and discuss a book, both about today’s escalating hostility toward Muslim Americans. But Islamophobia is not the only subject on the table: Scanlon and his cohorts also want to talk about patriotism — and peace. Scanlon, who lives in Andover, is joined by four colleagues at the event organized by assistant sociology professor Sara B. Moore. Shareda Hosein of Quincy and Juston Eivers of Newton represent the Boston group. Hosein, 55 and retired from the Army and the Army Reserves after a 35-year career, is an American Muslim, born in Trinidad and raised in Boston. Eivers, 45, is a 1989 graduate of Brookline High School and a Navy veteran who served from 1992 to 1996. Army veterans David Wise, 84, of Rockport, a noncombatant who served in the 1950s, and Martin Ray, 70, a Vietnam veteran from Gloucester, are the North Shore contingent, members of the Samantha Smith chapter in Ispwich. Veterans For Peace was started in 1985 in Portland, Maine, by handful of veterans concerned about US involvement in Central America. Today, it’s an international organization claiming a membership of about 4,500 in the United States, the United Kingdom, Ireland, Mexico, South Korea, Australia, Canada, and Vietnam. Since 1991, according to Barry Ladendorf, president of the group’s board of directors, it has held a permanent nongovernmental organization seat at the United Nations; over the past 30 years, moreover, the group has led or participated in delegations to Central America, the Middle East, and other regions in conflict. In this country, members march in peace walks, join environmental protests, and work to end the proliferation of nuclear weapons. This year, the Albany, N.Y., chapter is helping citizens register to vote. 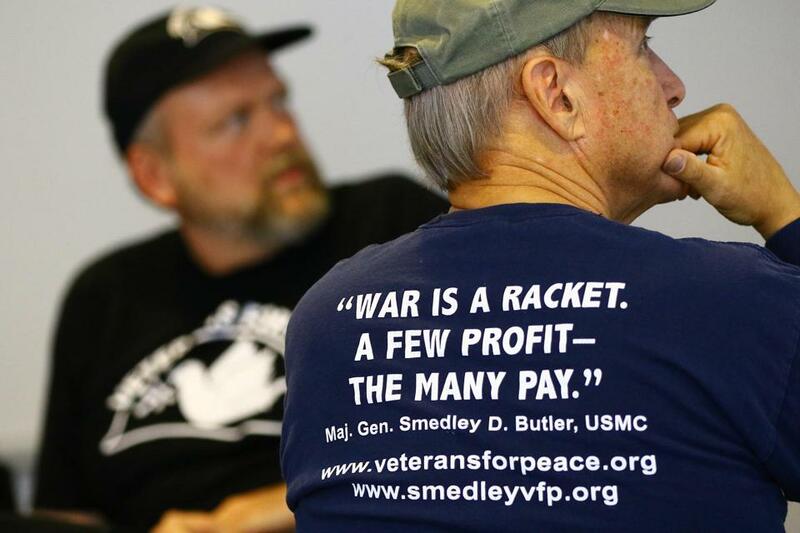 To get its message out, Veterans For Peace is more than willing to travel across New England and beyond. But it has taken its strongest stand close to home, challenging the established — and often entrenched — policies of traditional veterans organizations. About 10 years ago, when the group approached the American Legion asking to join its annual Boston Veterans Day parade, it was told it would be welcome only if it complied with strict orders: no carrying its flag, no signs, and no cadences. In addition, all marchers would have to walk in formation. And there have been other challenges. Five years ago, the South Boston Allied War Veterans Council rejected a request from the local Veterans For Peace chapter to march in the annual St. Patrick’s Day parade. “They did not want to have the word ‘peace’ associated with the word ‘veteran,’ ” says Scanlon. So again, chapter members started their own parade, reaching out to the LGBT community, which for years had been rebuffed each time they asked to join the South Boston event. Last year, the chapter briefly challenged the parade organizers in federal court before dropping the suit. The Boston chapter meets monthly at St. Peter’s Episcopal Church in Cambridge, drawing members from across the state. Bridgewater resident Ray Ajemian, for example, who served in the Army from 1965 to 1967 and was then an artillery instructor, joined the group about 13 years ago. Juston Eivers had a similar epiphany. Lara Hoke, 48, of Andover was finishing college and ROTC when the Berlin Wall fell, the Soviet Union came apart, and she found herself “questioning our new foreign policy and ways of being at war,” she says. She served from 1990 to 1994 as a special agent for the Naval Criminal Investigative Service, pursuing foreign intelligence and criminal investigations. Now minister of Andover’s Unitarian Universalist Congregation, Hoke joined the Smedley D. Butler Brigade chapter in 2009. On Nov. 11, she will offer the opening remarks at Faneuil Hall, as part of a quiet meditation at the end of the organization’s alternative march behind the Boston Veterans Day parade. In the classroom at Salem State, the conversation takes a turn. “I have a lot of distress about what I saw,” says a heavily muscled student recently back from a tour of duty in the Middle East. “I cannot physically read [Bayoumi’s book] right now.” Still on active duty, he requests anonymity, saying he’s not allowed to discuss his political views. He says he can’t talk about discrimination and hatred toward Muslims when homeless US veterans are walking the streets. “This is a fallout of war,” he says, almost in self-defense. But while he’s not quite ready to embrace the humanity of Muslims, he won’t rule it out.